Angioplasty is a procedure to open narrowed or blocked blood vessels that supply blood to the heart. These blood vessels are called the coronary arteries. 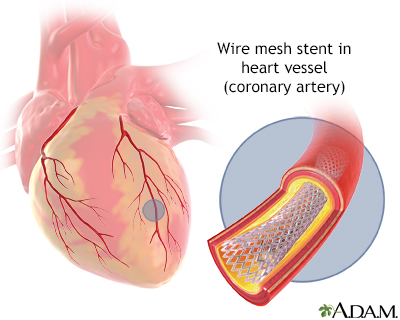 A coronary artery stent is a small, metal mesh tube that expands inside a coronary artery. A stent is often placed during or immediately after angioplasty. It helps prevent the artery from closing up again. A drug-eluting stent has medicine embedded in it that helps prevent the artery from closing in the long term. Before the angioplasty procedure begins, you will receive some pain medicine. You may also be given medicine that relaxes you, and blood-thinning medicines to prevent a blood clot from forming. You will lie on a padded table. 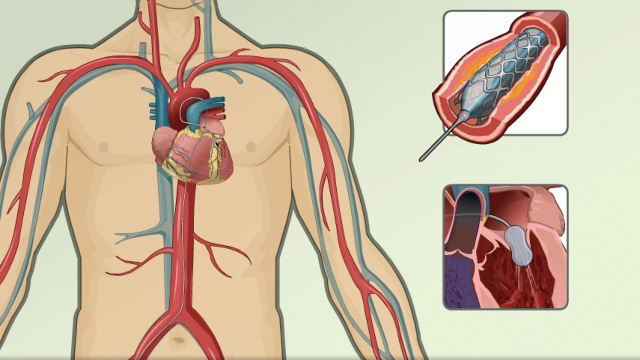 Your doctor will insert a flexible tube (catheter) into an artery. Sometimes the catheter will be placed in your arm or wrist, or in your upper leg (groin) area. You will be awake during the procedure. The doctor will use live x-ray pictures to carefully guide the catheter up into your heart and arteries. Liquid contrast (sometimes called "dye," will be injected into your body to highlight blood flow through the arteries. This helps the doctor see any blockages in the blood vessels that lead to your heart. A wire mesh tube (stent) may then be placed in this blocked area. The stent is inserted along with the balloon catheter. It expands when the balloon is inflated. The stent is left there to help keep the artery open. The stent may be coated with a drug (called a drug-eluting stent). This type of stent may lower the chance of the artery closing back up in the future. Currently, drug-eluting stents are used in certain situations. Arteries can become narrowed or blocked by deposits called plaque. Plaque is made up of fat and cholesterol that builds up on the inside of artery walls. This condition is called hardening of the arteries (atherosclerosis). Not every blockage can be treated with angioplasty. Some people who have several blockages or blockages in certain locations may need coronary bypass surgery. Heart bypass surgery creates a new route, called a bypass, for blood and oxygen to go around a blockage to reach your heart. Clogging of the inside of the stent (in-stent restenosis). This can be life-threatening. 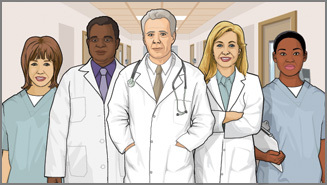 Tell your health care provider what drugs you are taking, even drugs or herbs you bought without a prescription. You will most often be asked not to drink or eat anything for 6 to 8 hours before the test. Tell your provider if you are allergic to seafood, you have had a bad reaction to contrast material or iodine in the past, you are taking Viagra, or you are or might be pregnant. The average hospital stay is 2 days or less. Some people may not even have to stay overnight in the hospital. In general, people who have angioplasty are able to walk around within a few hours after the procedure depending on how the procedure went and where the catheter was placed. Complete recovery takes a week or less. You will be given information how to care for yourself after angioplasty. For most people, angioplasty greatly improves blood flow through the coronary artery and the heart. It may help you avoid the need for coronary artery bypass surgery (CABG). Angioplasty does not cure the cause of the blockage in your arteries. Your arteries may become narrow again. Follow your heart-healthy diet, exercise, stop smoking (if you smoke), and reduce stress to lower your chances of having another blocked artery.Your provider may prescribe medicine to help lower your cholesterol or control your blood pressure. Taking these steps can help reduce your chances of complications from atherosclerosis. Amsterdam EA, Wenger NK, Brindis RG, et al. 2014 AHA/ACC guideline for the management of patients with non ST-elevation acute coronary syndromes: a report of the American College of Cardiology/American Heart Association Task Force on Practice Guidelines. J Am Coll Cardiol. 2014;64(24):e139-e228. PMID: 25260718 www.ncbi.nlm.nih.gov/pubmed/25260718. Fihn SD, Blankenship JC, Alexander KP, et al. 2014 ACC/AHA/AATS/PCNA/SCAI/STS focused update of the guideline for the diagnosis and management of patients with stable ischemic heart disease. Circulation. 2014;130(19):1749–1767. PMID: 25070666 www.ncbi.nlm.nih.gov/pubmed/25070666. O'Gara PT, Kushner FG, Ascheim DD, et al. 2013 ACCF/AHA guideline for the management of ST-elevation myocardial infarction: a report of the American College of Cardiology Foundation/American Heart Association Task Force on Practice Guidelines. Circulation. 2013;127(4):529-555. PMID: 23247303 www.ncbi.nlm.nih.gov/pubmed/23247303. How cardiac catheterization is used to treat a variety of heart problems. 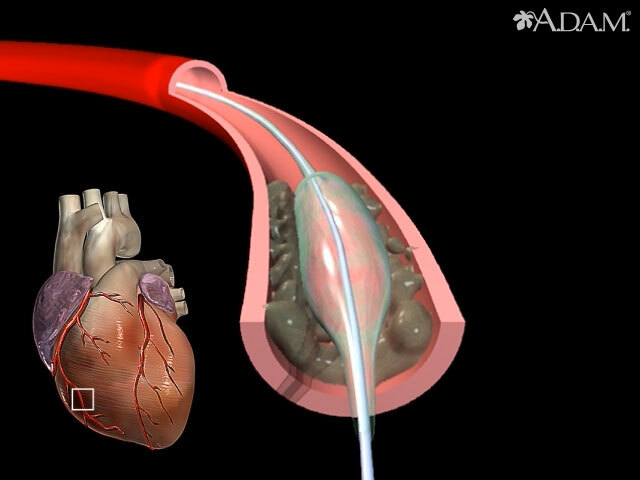 This animation shows the use of balloon angioplasty to open a narrowed coronary artery lumen caused by deposits of plaque. An intraluminal coronary artery stent is a small, self-expanding, stainless steel mesh tube that is placed within a coronary artery to keep the vessel open. It may be used during a coronary artery bypass graft surgery to keep the grafted vessel open, after balloon angioplasty to prevent reclosure of the blood vessel, or during other heart surgeries.